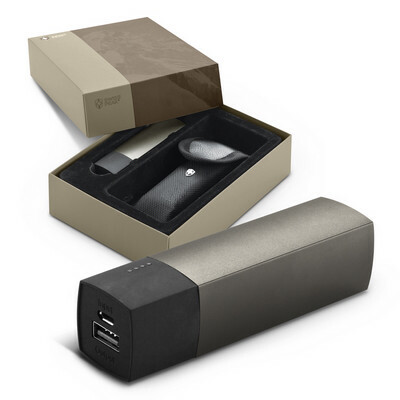 Another outstanding Swiss Peak lifestyle gift which is designed for use in the home, car and of course the outdoors. The powerful flashlight converts to a lantern or flashing red emergency light but the features don't stop there. It also boasts a 4000mAh power bank which has plenty of power for charging phones and other small electronic devices. 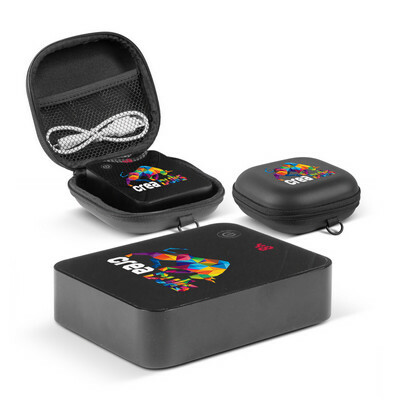 It is beautifully presented in a printed gift box along with a smart carry case, carabiner and a micro USB cable. Output power is 5V/2A, input power is 5V/1.5A and Apple connectors are available for an additional charge. Colours: Black/Grey. Dimension: Lantern: H 108mm x W 53mm x 53mm (closed). Print Description: 30mm x 40mm. Print Type: Pad Print. Packing: Gift box. Swiss Peak innovation that really packs a punch for people on the move. This rugged 8800mAh rain and dust proof power bank is designed for use outdoors and will charge phones and tablets as well as other electronic devices. 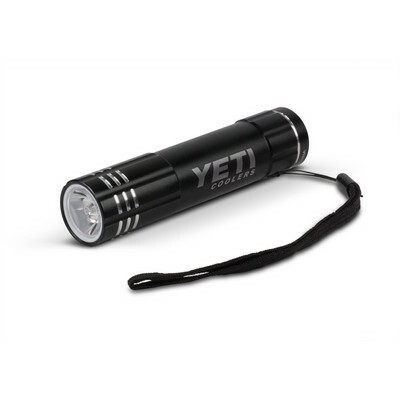 Additional features include a power indicator, a flashlight, a carry pouch with a belt loop, a micro USB cable and it is presented in printed gift box. The output power is 5V/2A and input power is 5V/1.5A. Colours: Grey/Black. Dimension: Power bank: L 125mm x W 75mm x 24mm. Print Description: Carry Case - 50mm x 20mm (one colour). Print Type: Pad Print. Packing: Gift box. Sunflower brings solar energy to any home or office with a smile! Its powerful 2500mAh rechargeable lithium battery will charge a smart phone and other small electronic devices. Sunflower is a unique, thought-provoking gift that will attract attention and is beautifully presented in a printed gift box. 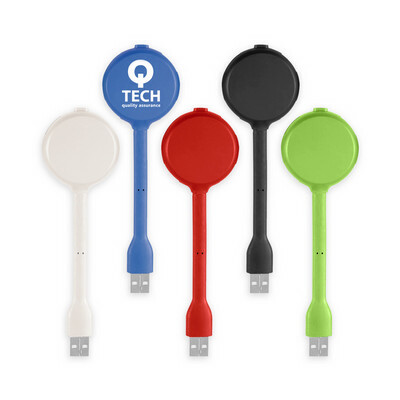 A micro USB cable is included and Apple connecters are available for an additional cost. Colours: White/Green. Dimension: Charger: H 230mm x Dia 92mm. Print Description: 40mm x 25mm. Print Type: Pad Print. Packing: Gift box. Give the gift of solar energy with Sun Solo which is nicely presented in a stunning printed gift box. This unique window charger has a 2500mAh rechargeable lithium polymer battery which will charge smartphones and other small electronic devices using free solar energy. Ideal for use at home, in the office, car or caravan. Simply fix Sun Solo to any window with the powerful suction cup and allow it to charge. Colours: White. Dimension: Charger: L 235mm x W 74mm x 24mm. Print Description: 60mm x 50mm. Print Type: Pad Print. Packing: Gift box. Robust aluminium USB hub with four ports and a USB 2.0 interface. Laser engraves to an oxidised White colour. A lead time of 10-15 working days applies to this product. Colours: Red, Blue, Black. Dimension: W 89mm x H 38mm. Print Description: 76mm x 11mm. Print Type: Laser Engraving. Packing: Loose packed. Less than minimum quantities are not available for this item. MOQ applies per colour on this item. 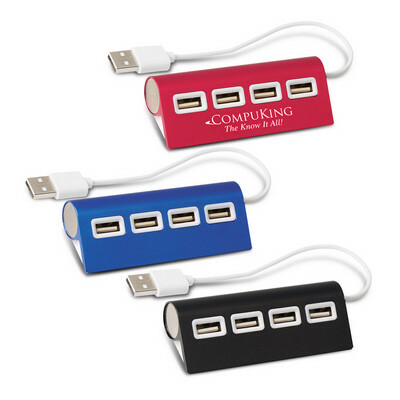 Smart USB hub with a flip out connector which has four ports and USB 2.0 interface. A lead time of 10-15 working days applies to this product. Colours: White, Red, Lime Green, Blue, Black. Dimension: W 51mm x H 38mm. Print Description: 38mm x 22mm (two colour max). Print Type: Screen Print. Packing: Loose packed. Less than minimum quantities are not available for this item. MOQ applies per colour on this item. Handy four port USB hub with a USB 2.0 interface. Has the added feature of a bright LED light and a flexible cable so it can be used for illuminating a key board or reading a book etc. when there is no other light source available. A lead time of 10 - 15 working days applies to this product. Colours: White, Red, Lime Green, Blue, Black. Dimension: H 143mm. Print Description: 25mm Circle (two colour max). Print Type: Pad Print. Packing: Loose packed. Less than minimum quantities are not available for this item. MOQ applies per colour on this item. 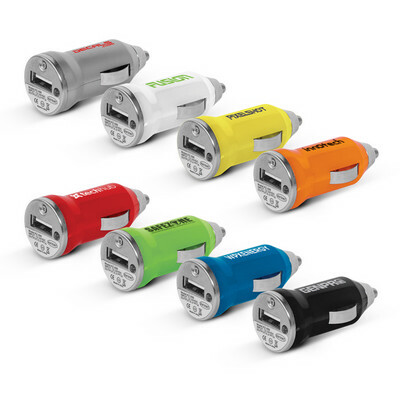 Swivel car charger with a key ring attachment and a one Amp output. A lead time of 10-15 working days applies to this product. Colours: White, White/Red, White/Lime Green, White/Blue, White/Black. Dimension: W 63mm x H 19mm. Print Description: 25mm x 12.5mm (two colour max) . Print Type: Screen Print. Packing: Loose packed. Less than minimum quantities are not available for this item. MOQ applies per colour on this item. Compact 2200mAh power bank in a smart aluminium finish. It is ideal for charging mobile phones, tablets, cameras, GPS, Bluetooth speakers and headphones etc. Recharging time is 4-5 hours and the lithium ion battery can be recharged over 500 times from any USB port or mains adaptor. Comprehensive instructions along with a micro USB cable are included and an optional EVA carry case along with a wide range of accessories are available for an additional cost. Laser engraves to an oxidised White colour. 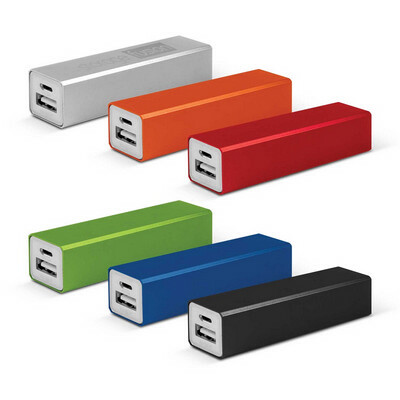 Colours: Power Bank: Silver, Orange, Pink, Red, Bright Green, Blue, Purple, Black. Carry Case: White, Yellow, Orange, Red, Bright Green, Light Blue, Dark Blue, Black. Dimension: Power bank: L 94mm x W 22mm x 21mm. Print Description: Power bank - 60mm x 15mm. Print Type: Pad Print. Packing: Individual boxes or an optional carry case. Slim 4000mAh power bank with a smart aluminium finish which is ideal for charging mobile phones, tablets, cameras, GPS, Bluetooth speakers and headphones etc. The slim rectangular profile is ideal for sliding into a pocket alongside a phone while it is being charged. The Pulse Power Bank also features a flashlight and is easily recharged from any USB port or mains adaptor. Recharging time is 5-6 hours and the lithium polymer battery can be recharged over 500 times. Comprehensive instructions along with a micro USB cable are included and an optional EVA carry case along with a wide range of accessories are available for an extra charge. Laser engraves to an oxidised White colour. Colours: Power bank: Silver, Red, Blue, Black. Carry case: Black. Dimension: Power bank: L 104mm x W 57mm x 9mm. Print Description: Power bank - 50mm x 30mm. Print Type: Pad Print. Packing: Individual boxes or an optional carry case. Stylish 5600mAh power bank which is ideal for charging mobile phones, tablets, cameras, GPS, Bluetooth speakers and headphones etc. Other features include a handy flashlight and an LED power gauge. 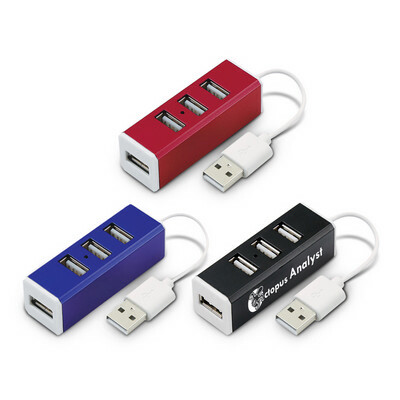 The Edison Power Bank is easily recharged from any USB port or mains adaptor. Recharging time is 6-7 hours and the lithium ion battery can be recharged over 500 times. Comprehensive instructions along with a micro USB cable and an optional EVA carry case along with a wide range of accessories are available for an additional charge. Colours: Power bank: White, Black. Carry case: Black. Dimension: Power bank: L 97mm x W 44mm x 22mm. Print Description: Power bank - 45mm x 22mm. Print Type: Pad Print. Packing: Individual boxes or an optional carry case. Substantial power station which packs enough punch to charge the average tablet with its massive 8800mAh of power. It has dual output ports with 2 Amps for tablets and 1 Amp for smaller devices like phones, cameras, GPS, Bluetooth speakers and headphones etc. The dual ports also allow two devices to be charged at the same time. 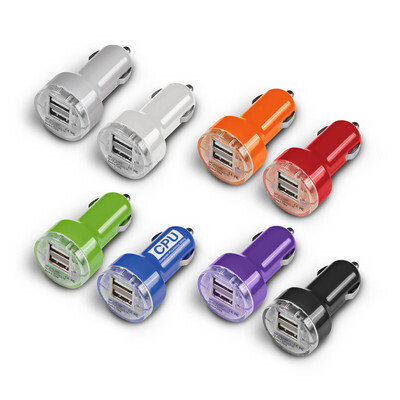 The Fusion Power Station has an LED power gauge and is easily recharged from any USB port or a mains adaptor. Recharging time is 9-10 hours and the lithium ion batteries can be recharged over 500 times. 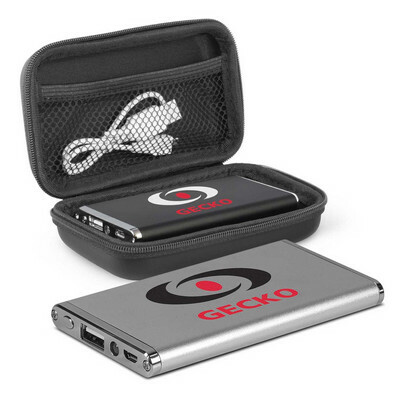 Comprehensive instructions along with a micro USB cable are included and it is supplied in a smart EVA carry case. A wide range of accessories are available for an additional cost. Colours: Power station: Black. Carry case: Black. Dimension: Power station: L 95mm x W 76mm x 22mm. Print Description: Power station - 50mm x 50mm. Print Type: Pad Print. Packing: Carry case. 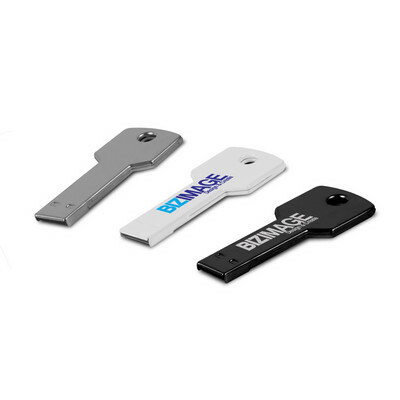 Key shaped flash drive with 4GB of memory and a USB 2.0 interface. Other memory sizes are available on indent and data uploading is also available. Colours: Silver, White, Black. Dimension: L 57mm x W 24mm x 3mm. Print Description: 32mm x 9mm. Print Type: Pad Print. Packing: Bubble wrap sleeve. Compact 2200mAh power bank which is ideal for charging mobile phones, tablets, cameras, GPS, Bluetooth speakers and headphones etc. Recharging time is 4-5 hours and the lithium ion battery can be recharged over 500 times from any USB port or mains adaptor. Comprehensive instructions along with a micro USB cable are included and an optional EVA carry case along with a wide range of accessories are available for an additional cost. Colours: Power bank: White, Black. Carry case: White, Yellow, Orange, Red, Bright Green, Blue, Black. Dimension: Power bank: L 95mm x W 24mm x 24mm (excludes key ring). Print Description: Power bank - 93mm x 20.5mm. Print Type: Resin Coated Finish. Packing: Individual boxes or an optional carry case. Rechargeable aluminium torch which doubles as a 2200mAh power bank for charging mobile phones etc. Recharging time is 4-5 hours and the lithium ion battery can be recharged over 500 times from any USB port or mains adaptor. Comprehensive instructions along with a micro USB cable are included and a wide range of accessories are available for an additional cost. Laser engraves to an oxidised White colour. Colours: Torch: Black. Carry case: Black. Dimension: Torch: Dia 25.5mm x L 108mm. Print Description: Torch - 35mm x 12mm. Print Type: Pad Print. Packing: Individual boxes or an optional carry case. 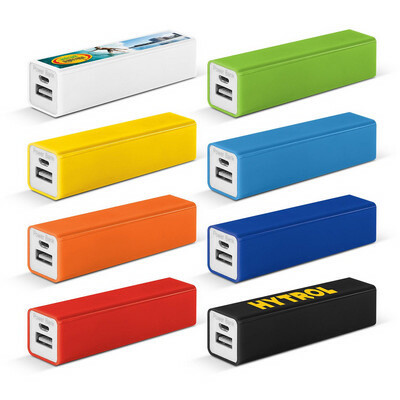 Compact 2200mAh power bank featuring stunning full colour wrap around branding. It is ideal for charging mobile phones, tablets, cameras, GPS, Bluetooth speakers and headphones etc. Recharging time is 4-5 hours and the lithium ion battery can be recharged over 500 times from any USB port or mains adaptor. Comprehensive instructions along with a micro USB cable are included and an optional EVA carry case along with a wide range of accessories are available for an additional cost. A lead time of 20 working days applies to this product. Colours: Power bank: White. Carry case: White, Yellow, Orange, Red, Bright Green, Blue, Black. Dimension: Power bank: L 91mm x W 25mm x 25mm. Print Description: Power bank - Please refer to template. Print Type: Digital Label. Packing: Individual boxes or an optional carry case. Less than minimum quantities are not available for this item. MOQ applies per colour on this item. 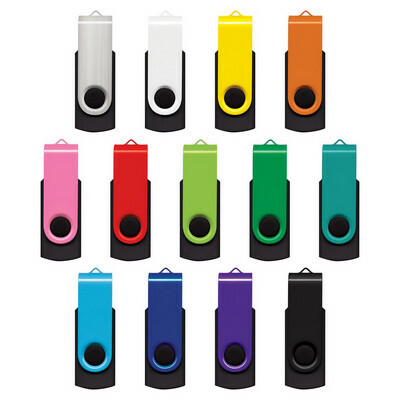 Pick your own flash drive clip colour to match your corporate colour with 13 ex stock clip colours to choose from with a Black 16GB body. Any colour combination can be ordered with 1GB, 2GB, 4GB, 8GB and 16GB memory sizes on indent. All chips have a USB 2.0 interface and data uploading is available. Colours: Silver/Black, White/Black, Yellow/Black, Orange/Black, Pink/Black, Red/Black, Bright Green/Black, Green/Black, Teal/Black, Light Blue/Black, Blue/Black, Purple/Black, Black/Black. Dimension: Flash drive: L 56mm x W 20mm x 10mm. Print Description: 28mm x 15mm. Print Type: Pad Print. Packing: Bubble wrap sleeve or optional gift box. 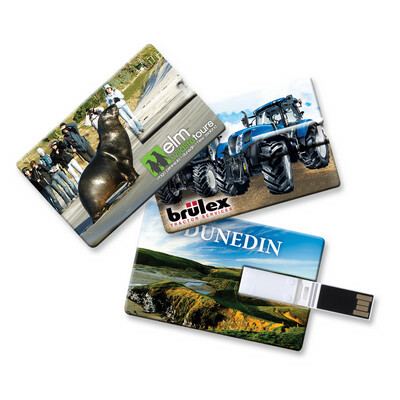 Credit card size flash drive which can be branded with stunning full colour graphics on one or both sides. 4GB of memory with USB 2.0. 2GB, 8GB and 16GB memory options and data uploading are also available. Colours: White. Dimension: W 55mm x L 85mm x 2mm. Print Description: 85mm x 54mm. Print Type: Direct Digital. Packing: Loose packed. 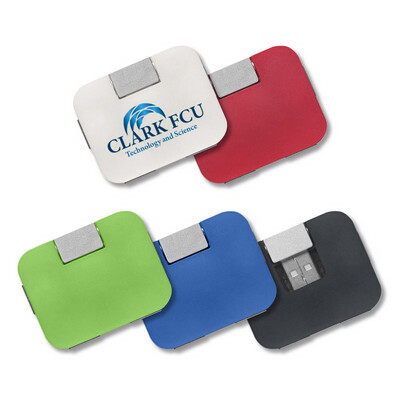 Credit card size flash drive which can be branded with stunning full colour graphics on one or both sides. 8GB of memory with USB 2.0. 2GB, 4GB and 16GB memory options and data uploading are also available. Colours: White. Dimension: W 55mm x L 85mm x 2mm. Print Description: 85mm x 54mm. Print Type: Direct Digital. Packing: Loose packed. Stylish aluminium USB hub with four ports and a USB 2.0 interface. Laser engraves to an oxidised White colour. A lead time of 10-15 working days applies to this product. Colours: Red, Blue, Black. Dimension: W 63mm x H 22mm. Print Description: 44mm x 12.5mm. Print Type: Laser Engraving. Packing: Loose packed. Less than minimum quantities are not available for this item. MOQ applies per colour on this item. Round USB hub with four ports and a USB 2.0 interface.The cable wraps neatly around the unit when it is not in use. A lead time of 10-15 working days applies to this product. Colours: White/Red, White/Lime Green, White/Blue, White/Black. Dimension: Dia 51mm. Print Description: 38mm Circle. Print Type: Pad Print. Packing: Loose packed. Less than minimum quantities are not available for this item. MOQ applies per colour on this item. 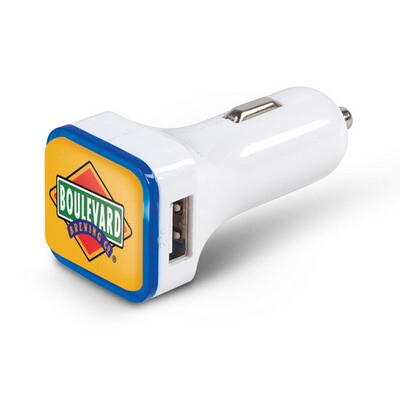 Dual USB car charger with both one Amp and 2.1 Amp output. Has overload and short circuit protection. A lead time of 10-15 working days applies to this product. Colours: Silver, White, Orange, Red, Lime Green, Blue, Purple, Black. Dimension: W 57mm x H 19mm. Print Description: 19mm x 11mm (two colour max). Print Type: Pad Print. Packing: Loose packed. Less than minimum quantities are not available for this item. MOQ applies per colour on this item. Swiss Peak excels in designing practical lifestyle products and this compact, yet powerful 5000mAh power bank with its own LED power gauge is no exception. The unit has an output of 5V/1A and an input of 5V/800mAh which is ideal for charging phones, cameras and hand held GPS. It has it own custom carry pouch with a belt loop and is beatifully presented in a printed gift box along with a micro USB cable. Colours: Black/Grey. Dimension: Power Bank: L 105mm x W 25mm x 25mm. Print Description: 65mm x 20mm. Print Type: Pad Print. Packing: Gift box. 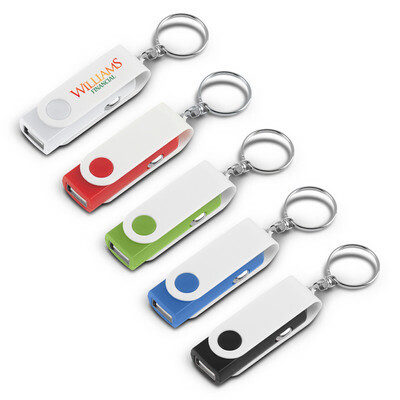 Credit card size flash drive which can be branded with stunning full colour graphics on one or both sides. 2GB of memory with USB 2.0. 4GB, 8GB and 16GB memory options and data uploading are also available. Colours: White. Dimension: W 55mm x L 85mm x 2mm. Print Description: 85mm x 54mm. Print Type: Direct Digital. Packing: Loose packed.